The Georgia Buddhist Vihara wishes you a happy and peaceful Wesak!. Wesak full moon day has for centuries been regarded as the Buddha Day. For it was on a Wesak full moon day that three major events occurred in the life of the Sakyan prince, Siddhartha Gautama. 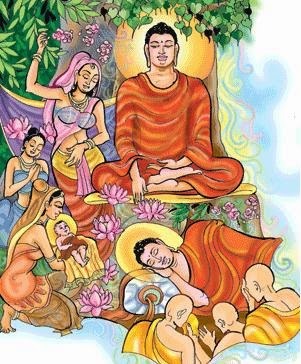 On the Wesak full moon day Siddhartha Gautama was born in Lumbini Park on the Nepal frontier; on this day Prince Siddhartha became the Buddha by attaining Enlightenment under the Bodhi tree in Bodh Gaya; and, finally, the the Buddha passed away near Kushinagara. For this reason, Buddhists from all over the world celebrate with whole-hearted devotion the Triple Anniversary Day of Wesak. For the true follower of the Buddha and the Buddhist path, there is no greater day than Wesak poya which symbolizes peace, love, and piety. This year, the Georgia Buddhist Vihara’s Wesak program will consist of various opportunities for devotees to attend and participate in this great day of auspiciousness. Participants will have the opportunity to make Wesak lanterns, Sunday school children and community elders will perform traditional devotional songs, an award ceremony for Sunday school children, and the offering of dinner for participants (dansala). Participants will have the opportunity to observe the eight precepts (Sil) as part of the Wesak program from 7:30am till 5:00 pm. All participants are welcome and encouraged to be on time. 10.00 am Observance of the Sil for children. Children will observe the Eight Precepts until 2 pm. 04.00 pm Termination of Sil for adults, Atavisi Buddha Puja, Pirith chanting, Dhamma talks. Dansala: Providing dinner for all participants. May all beings have happy minds!